Webpage created: August 02, 2017. 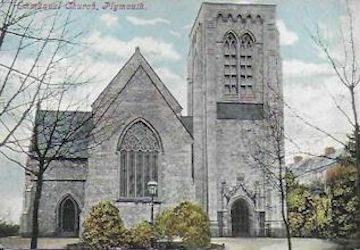 The Anglican Church of Emmanuel is situated on the eastern side of Tavistock Road, Mannamead, Plymouth. Anglican Church of Emmanuel, Compton Gifford. The "Tything of Compton Gifford" was an old civil parish, originally held with the Parish of Saint Andrew the Apostle. The ecclesiastical parish was formed out of the Parish of Charles on December 22nd 1871. A portion of the Parish of Saint Andrew's to the east of Mutley Plain was added in 1880 but was later split between the parishes of Saint Gabriel's and Saint Matthias. It was not until the wealthier residents of Plymouth started to look outside the Town for land on which to build houses for themselves that Compton grew from being a small village to the suburb that it is today. It was one of those new residents, a Captain J Gordon Bremer, who gave a site for a new chapel and donated £200 towards the cost of building it. The original building was licensed in 1836. But this quickly became too small and in 1866 a meeting was held to discuss the erection of a more substantial place of worship. A site was presented by Mrs Betsy Revel and her daughter, Elizabeth, in memory of her son. He had said before his death that he wanted to do something about a church for Compton and that when built, he would like it named after Emmanuel College at Cambridge University, where he had studied. Built of stone in the Decorated style, this Church was begun on June 17th 1869, when the Reverend Henry Greaves from Charles' Church laid the a corner stone. It was design by Mr W H Reid, who made no charge for his services. The Revel family had retained ownership of the strip of land between the Church and Tavistock Road and they let this to a Mr Marshall. Unfortunately, he commenced building some villas on this site, which completely blocked the view of Emmanuel from the roadway and ruined the setting. To the rescue came Mr C T Bewes and Mr W Luscombe, who bought the land off Mr Marshall and pulled the villas down. In September 1870 the nave of Emmanuel Church was completed and the Church opened for worship. The eastern extensions comprising the north and south transepts, chancel, organ chamber and vestry, were designed by Messrs Hine and Odgers, of Plymouth. It was opened for worship by the Bishop of Exeter on Monday July 18th 1881, during the incumbency of the Reverend George B Berry. This extension meant that the chancel, with the vestry on the side side and the organ chamber on the south side, was 33 feet in length and 23 feet in width. The outer walls were of wrought limestone with dressings of Portland, Doulting and Bath stone. The stone carvings above the choir were by Mr Harry Hems, of Exeter, and his staff. As the Church was designed in the cruciform fashion, it was planned to have a central tower but by the time of the extension that idea had been abandoned. Instead it was raised at the south-western corner. A Mr T C Rogers designed the tower, the memorial stone of which was laid by the Mayor of Plymouth, Mr Law, on Wednesday July 17th 1895. The architect was Mr Bone and the contractor was Mr Jonathan Marshall. [There is a discrepancy here, of course: perhaps Mr Rogers made the general design and Mr Bone actually drew up the plans.] A sealed bottle was placed in a cavity within the stone which contained, in addition to copies of the western Morning News, a parchment document bearing the signatures of the vicar, the Reverend George B Berry BA; the curates, the Reverends N N Lewarne MA and J H Haywood; the churchwardens, Mr W M F Hugo and Mr Thomas Harris; the treasurer, Admiral Sir George Watson KCB; the secretary, Mr E Tidboald; along with Captain Henry Rogers RN; Mr Edward Dingle; Mr P K Truscott; Mr A W Alabaster; Captain B Matheson; Captain J R Quinn; Mr T Roberts; Mr F H Goulding; Mr Samuel Hockridge; Mr C H Andrew; and Mr W H Probert. The Tower was meant to support a spire but the money, and, it would seem, the will, ran out. The Tower itself was to cost £3,500 but only half of that had been raised. The proposed spire was to cost a further £1,600 but only £210 had been promised. The east window was donated by the Pearn family as a memorial to their mother. It was designed and made by the eminent artist Mr Morris. The window in the west end is dedicated to the men of the parish who fell in the Great War. There is a chapel, dedicated in 1919, to the memory of Captain Henry Harris Jago, DSO, MC, and Second Lieutenant Edward Arthur Jago, killed in France in 1916 and 1918 respectively. There are other windows to the memory of the Hicks, Jackson, Rendle and Jenkins families. A brass lectern was manufactured by Messrs Cox and Company and donated by a Mr Dickerson. The carvings of angels on the stall ends at the chancel entrance were the work of Mr S Trevenen, of Plymouth. The cornice of oak trees and acorns was carved by Mr Moutrie, of Tavistock. All the gas standards were supplied by Messrs Hart, Son, and Peard, of Wych Street. Linking the old and new parts of Emmanuel Church 'was attended with considerable difficulties and some danger' but this was satisfactorily accomplished by the contractor, Mr Blowey, and his workmen. Messrs Hele and Company re-erected the organ in the new organ chamber. Emmanuel has a peel of eight bells in the tower, all cast in 1904 by Messrs John Warner & Sons. The tenor bell, weighing 21 cwt 2 qrs 12 lbs, was re-hung in 1929 by Messrs John Taylor & Company of Loughborough, who did the same with the remaining seven bells in 1939. Mr Norrington, of Abbotsfield, Compton, made a substantial donation towards the cost of the bells.